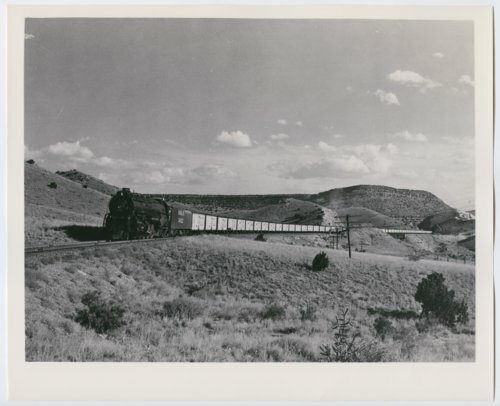 This photographs shows the Atchison, Topeka & Santa Fe Railway Company's steam locomotive #5022 pulling rolling stock through a unidentified location. The "Texas" type locomotive, built in 1944 by the Baldwin Locomotive Works of Philadelphia, Pennsylvania, has a 2-10-4 wheel arrangement. It was later scrapped for metal by 1959.